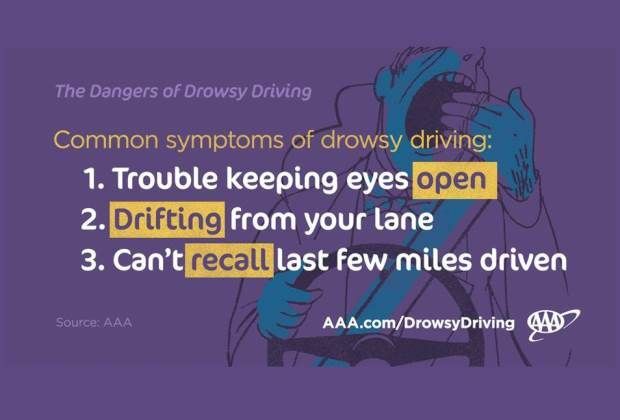 The most in-depth drowsy driving research ever conducted in the U.S. using footage of everyday drivers found that the percentage of crashes involving drowsiness is nearly eight times higher than federal estimates indicate, according to the AAA Foundation for Traffic Safety. Drivers, however, should not rely on their bodies to provide warning signs for drowsiness and should instead prioritize getting at least seven hours of sleep before hitting the road. • Do not underestimate the power of a quick nap. Pulling into a rest stop and taking a quick catnap -- at least 20 minutes and no more than 30 minutes of sleep-- can help to keep you alert on the road. To help drivers determine if their medications may cause drowsiness, AAA and the AAA Foundation developed Roadwise Rx, a free and confidential online tool that generates personalized feedback about how the interactions between prescription, over-the-counter medicines and herbal supplements can affect safety behind the wheel. The AAA Foundation for Traffic Safety’s report, Prevalence of Drowsy Driving Crashes: Estimates from a Large-Scale Naturalistic Driving Study, is based on the analysis of in-vehicle video footage of crashes that occurred during the Second Strategic Highway Research Program’s Naturalistic Driving Study (SHRP 2 NDS). The federally funded study recruited 3,593 drivers from six study sites across the U.S. Drivers were monitored continually using in-vehicle video and other data collection equipment while driving their personal vehicles for several months.